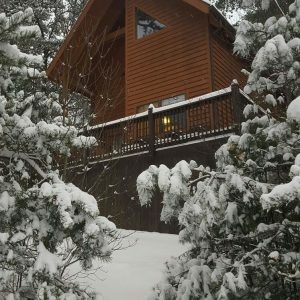 We want to thank you for such a thoughtful, furnished cabin as well a wonderful setting . It really made our mulitple celebrations special. All our needs were met and then some. It was very nice meeting you and seeing just how caring you are about your renters as well as your property. You seldon meet someone like you for it is usually all about getting and leaving the caring dangling. We also want to thank you for the very nice note and champagne, although we do not usually partake we are most appreciative.